Shares in UniCredit have jumped almost 15% after Italy's biggest bank said it would raise €13bn (£10.9bn) and cut 14,000 jobs to restore its fortunes. The bank plans to use the record rights issue to help remove almost €18bn of bad debt from its balance sheet and boost profitability. 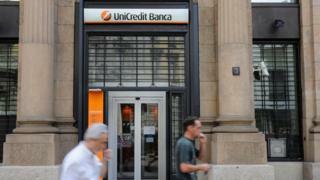 UniCredit also plans to close about a quarter of its 3,800 branches. The move comes as Italy's third-largest bank, Monte dei Paschi di Siena, tries to avoid a government bailout. Shares in UniCredit, whose financial health is considerably worse than its European rivals, rose 35 cents to €2.78 on the Milan stock exchange. However, the shares have fallen by almost half this year and the bank will be seeking to raise nearly as much as its market value. Chief executive Jean Pierre Mustier said it was a "pragmatic plan based on conservative assumptions, with tangible and achievable targets". He added: "We are taking decisive actions to deal with our [problem loan] legacy issues to improve and support recurring future profitability to become one of Europe's most attractive banks." The former Societe Generale executive has sold assets including fund manager Pioneer and Polish unit Bank Pekao since joining five months ago. "We've taken some bold actions because self-help is always the best thing to do," Mr Mustier told analysts. He pledged to cut his fixed salary by 40% to €1.2m and has vowed not to take an annual bonus for the next three years. Joseph Oughourlian, chief executive of Amber Capital, a shareholder in UniCredit, praised Mr Mustier. "Sorting out UniCredit is huge service and a plus for the Italian banking sector. We now have the two largest banks in Italy well-capitalised," he said. Italy's other major bank is Intesa Sanpaolo. Wealth manager Northern Trust Capital Markets said: "If one was to believe management can deliver on the plan ... and, should the environment turn in their favour, there is an argument to be said the shares look about 50% too cheap." UniCredit's cash call will take place in the first three months of the new year, with the funds used to remove €17.7bn of bad debts from its balance sheet. The bank aims to get its core capital ratio - a key measure of financial strength - above 12.5% by 2019, as well as post net profits of €4.7bn and resume dividend payments that year. The job cuts will amount to about 11% of its workforce. UniCredit's plans come as a new government takes office in Rome following the decision by prime minister Matteo Renzi to quit after losing a referendum vote over constitutional change. Elections are also expected next year.